5 Reasons to Consider Collectibles – What About Silver and Gold? This article presents the top 5 reasons that collecting tangible assets makes sense today. Assets expected to rise in value make the most sense, especially silver collectible coins or even gold for those that can afford it. Just considering the potential value of the metals content alone makes this a sensible strategy. What makes collectibles a good idea today? Fiat Currencies – All of today’s major currencies are fiat, including the US dollar, the euro, the yen, etc. 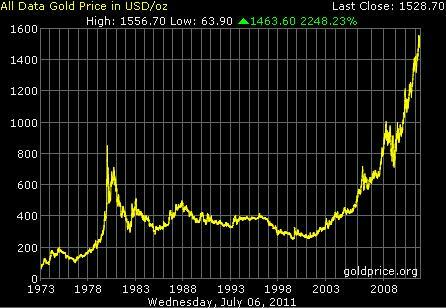 Richard Nixon started this trend when he removed the backing of the US dollar by precious metals in 1971. Since that time, the dollar has lost 95% of its value and the price of an ounce of gold has risen from about $40 to over $1500 today. US Spending and Runaway Debt – The US Federal Reserve is in the unique position of being able to print money to meet its obligations. This would be called counterfeiting in any other setting. Raising the nation’s “debt ceiling” may bring on some high political theater, but do we really believe Congress understands what a trillion dollars really is (or even a billion)? The US Economy may soon be entering uncharted waters when complete default on the country’s obligations occurs, sooner or later (possibly at a failure to raise the debt limit). Economic Opportunity – Although the world may not be facing another great depression, times of great financial upheaval have always represented times of great opportunity for those who are prepared. And if we are soon to be entering a period similar to the Great Depression, or worse, possession of valuable “hard assets” couldn’t hurt. Collectibles Performance – Most collectibles have failed to keep pace with the US stock market and are illiquid by nature, yet numismatics are viewed as one of the best available inflation hedges today. The inherent metals value makes this especially true of gold and silver coins. Popularity of gold and silver assets and the convenience of gold and silver coins is demonstrated by the countless television ads seen today. These are some great bottom-line reasons, if not a mandate, to collect precious assets.